The Numbers spreadsheet program, which is a free download from the App Store, can help you organize data and analyze important financial decisions for home and business — everything from a household budget to your company’s sales statistics! 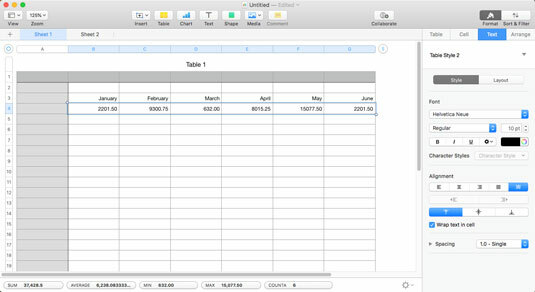 Numbers can open, edit, and save spreadsheets created with Microsoft Excel. Note, however, that not all Excel features are supported within Numbers. 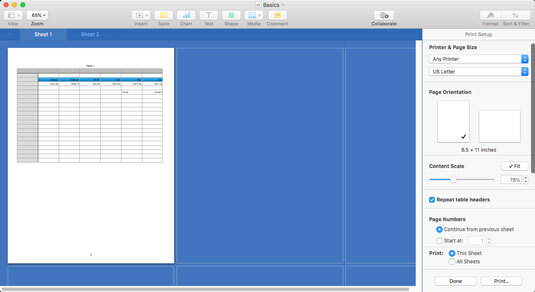 Like Pages, Numbers ships with a selection of templates you can modify quickly to create a new spreadsheet. For example, after a few modifications, you can easily use the Budget, Loan Comparison, and Mortgage templates to create your own spreadsheets. Click the New Document button at the lower-left corner of the Open dialog that appears. From the list on the left, click the type of document you want to create. The document thumbnails in the center are updated with templates that match your choice. Click the Choose button to open a new document using the template you selected. Hey, these templates aren’t frightening at all! If you see an existing Numbers document in a Finder window or the All My Files location (or you find it using Spotlight), just double-click the Numbers document icon to open it. Numbers automatically loads and displays the spreadsheet. If Numbers isn’t already running, click the Numbers icon from the Launchpad to run the program. 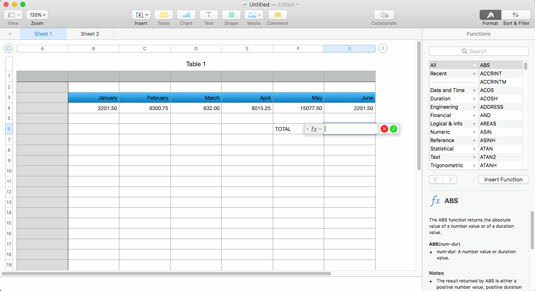 If the spreadsheet is stored in your iCloud Drive, click the Numbers item under the iCloud heading in the sidebar at the left of the dialog and then double-click the desired document thumbnail to load the spreadsheet. All three of Apple’s productivity applications — Pages, Numbers, and Keynote — feature an Open dialog that can display the contents of your iCloud Drive as well as your iMac’s internal drive. If the document is stored on your iMac’s internal drive, your network, or one of your Favorites locations, click the desired drive or folder in the sidebar at the left of the dialog. Drill down through folders and subfolders until you locate the desired Numbers document, and double-click the document thumbnail to load the spreadsheet. If you’re unsure where the document is, click in the Search box at the top of the Open dialog and type a portion of the document name or even a word or two of text it contains. Note that you can choose to search your drive, your iCloud Drive, or both. If you want to open a spreadsheet you’ve been working on over the last few days, choose File→ Open Recent to display Numbers documents that you’ve worked with recently. 2. Type a filename for your new spreadsheet. 3. Open the Where pop-up menu and choose a location in which to save the file. Common locations are your iCloud Drive, Desktop, Documents folder, and Home folder. After you save a Numbers document for the first time, you can create a version of that document by choosing File → Save. To revert the current document to an older version, choose File→ Revert To. You can choose to revert to the last saved version, or you can click Browse All Versions to look through multiple versions of the document and choose one of those to revert to. Sheets tabs: When a project contains multiple spreadsheets, Numbers indicates the spreadsheets in the Sheets tabbed bar at the top of the window. To switch among spreadsheets in a project, click the desired tab. 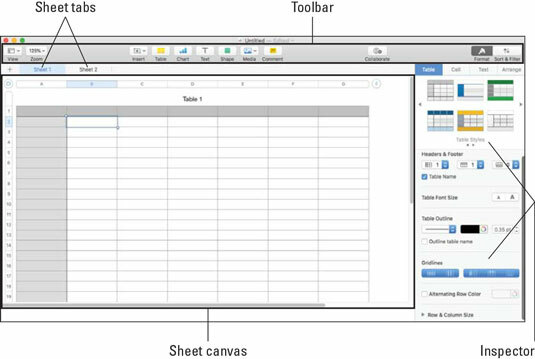 Sheet canvas: Numbers displays the rows and columns of your spreadsheet in this section of the window; you enter and edit cell values within the sheet canvas. 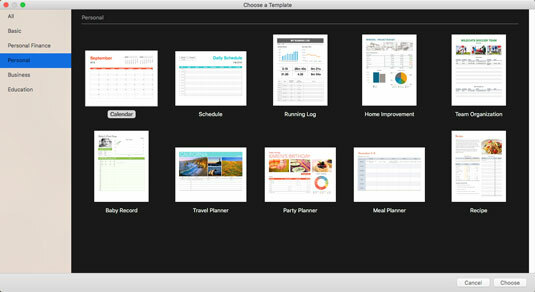 Toolbar: The Numbers toolbar keeps the most common commands you’ll use within easy reach. The Numbers window struts its stuff. You can use the scrollbars to move around your spreadsheet, but when you enter data into cells, moving your fingers from the keyboard is a hassle. Numbers has various handy navigation shortcut keys you can employ, as shown. After you commit these keys to memory, your productivity level will shoot straight to the top. To select a range of adjacent cells, click a cell at any corner of the range you want and drag in the direction you want. To select a row of cells, click the numeric heading button at the far left of the row. Spreadsheets can use both numbers and alphabetic characters within a cell; either type of information is considered data in the Spreadsheet World. To edit data: Click within the cell that contains the data error (to select the cell), and then click the cell again to display the insertion cursor. Drag the insertion cursor across the characters to highlight them, and then type the replacement data. To delete characters: Select the cell, and then highlight the characters and press Delete. After you enter your data (in a cell, row, or column), you might need to format it so that it appears correctly. For example, say you want certain cells to display a specific type of number, such as a dollar amount, percentage, or date. Numbers gives you a healthy selection of number-formatting possibilities. Characters and formatting rules — such as decimal places, commas, and dollar and percentage notation — are part of number formatting. If your spreadsheet contains units of currency, such as dollars, format it as such. Then all you need to do is type the numbers, and the currency formatting is applied automatically. Click the Format toolbar button. Click the Cell tab in the Inspector. From the Data Format pop-up menu, choose the type of formatting you want to apply, as shown here. From the Inspector, you can format the data you’ve entered. Click the Text tab of the Inspector to display the settings shown here. You can choose left, right, center, and justified (as well as the defaults of text left and numbers right). You also can format text to be aligned at the top, center, or bottom of a cell. Set text alignment within a cell. Do you need to set apart the contents of some cells? For example, you might need to create text headings for some columns and rows or to highlight the totals in a spreadsheet. To change such formatting, select the cells, rows, or columns you want to format, and then open the Font Family, Font Size, or Font Color buttons on the Text tab. Click the Cell tab of the Inspector. Click the triangle next to the Fill heading, and choose a shading option from the Fill pop-up menu. The following figure shows the controls for a gradient fill. Numbers displays a color picker (also shown). After you achieve the effect you want, click the color box again to close the color picker. Adding shading and colors to cells, rows, and columns is easy in Numbers. You can also add a custom border to selected cells, rows, and columns from the Cell tab. Click the triangle next to the Border heading to select just the right border. For a column: Right-click and choose Add Column Before, Add Column After, or Delete Column from the shortcut menu that appears. If you select multiple rows or columns, right-click and choose Add. Numbers inserts the same number of new rows or columns you selected. You can also insert rows and columns via the Table menu at the top of the Numbers window. Formulas in Numbers always start with an equal sign, and they may include one or more functions as well. A function is a preset mathematical, statistical, or engineering calculation that will be performed, like figuring the sum or average of a series of cells. “So what’s the big deal, Mark? Why not use a calculator?” Sure, you could. But maybe you want to calculate your weekly salary. Rather than grab a pencil and paper, you can simply change the contents of cell B1 to 52, and — boom! — the spreadsheet is updated to display your weekly salary. That’s a simple example, of course, but it demonstrates the basics of using formulas (and the reason why spreadsheets are often used to predict trends and forecast budgets). It’s the what-if tool of choice for everyone who works with numeric data. 1. Select the cell that will hold the result of your calculation. 2. Type = (the equal sign). The Formula Box appears within the confines of the cell. 3. Click the Format button on the Numbers toolbar to display the available functions in the Inspector, as shown. 4. Click the category of calculation you want from the left column of the Inspector. To display more information about a specific function, click it in the right column of the Inspector. Choosing the SUM function brings up a description at the bottom of the Inspector. 5. After you select the perfect function in the right column, click the Insert Function button. The function appears in the Formula box, along with any arguments it requires. In case you’re unfamiliar with the term argument, it refers to a value specified in a cell that a formula uses. For example, the SUM formula adds the contents of each cell you specify to produce a total; each of those cell values is an argument. 6. Click an argument button in the formula, and click the cell that contains the corresponding data. Numbers automatically adds the cell you indicated to the formula. Repeat this step for each argument in the formula. 7. After you finish, click the Accept button — the green checkmark — to add the formula to the cell. If you have to use formulas, at least Numbers can enter them for you. That’s it! Your formula is now ready to work behind the scenes, doing math for you so the correct numbers appear in the cell you specified. 1. Select the adjacent cells you want to chart by dragging. To choose individual cells that aren’t adjacent, you can hold down the Command key as you click. 2. Click the Chart button on the Numbers toolbar. The Chart button bears the symbol of a bar graph. Numbers displays the thumbnail menu shown. Note that you can display different categories of charts by clicking one of the three tabs at the top (2D/3D/Interactive), and you can scroll the menu to reveal additional thumbnails by using the left- and right-arrow buttons. 3. Click the thumbnail for the chart type you want. 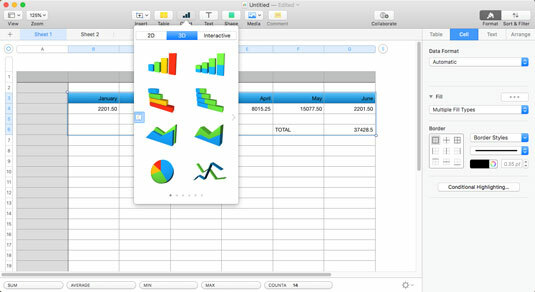 Numbers inserts the chart as an object within your spreadsheet so you can move the chart. You can drag using the handles that appear on the outside of the object box to resize your chart. With your chart selected, click the Format toolbar button to display your old friend the Inspector, complete with the controls you can use to customize your chart’s appearance. For example, you can change the colors and add (or remove) the title and legend. 4. To change the default title, click the title box to select it; click it again to edit the text. Numbers displays the range of chart styles you can use. You can easily send a Numbers spreadsheet to a USB or shared network printer — or, if you’d rather create an electronic copy of the document as an Adobe PDF, you can click the PDF button that appears on the Numbers Print dialog and select a location where the file will be saved. 1. Choose File→ Print from the Numbers menu bar to display the Print Setup window. 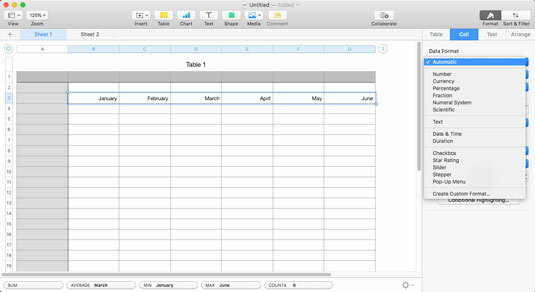 Because a Numbers document can contain multiple spreadsheets, you can select a specific spreadsheet to print (by clicking it in the grid and clicking the Print This Sheet radio button at the bottom of the window), or you can print all spreadsheets in the document (by clicking the Print All Sheets radio button). Options available from the Numbers Print Setup window. 2. Click the desired page orientation. 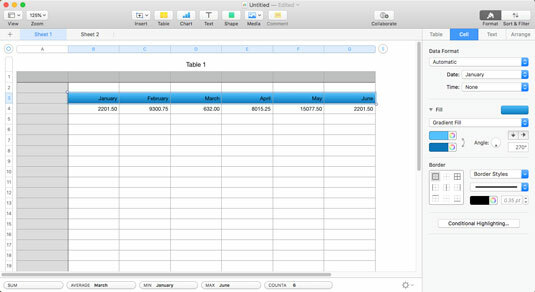 Spreadsheets with a large number of columns are often printed in landscape orientation to ensure that everything fits on the page. You can also scale the spreadsheet so it automatically fits on the page by clicking the Fit button (next to the Content Scale slider). 3. Click Print at the bottom of the window. Numbers displays the Print dialog shown. To display additional settings, click the Show Details button at the bottom of the sheet. 4. Click in the Copies field, and enter the number of copies you need. To print the entire spreadsheet, select All. 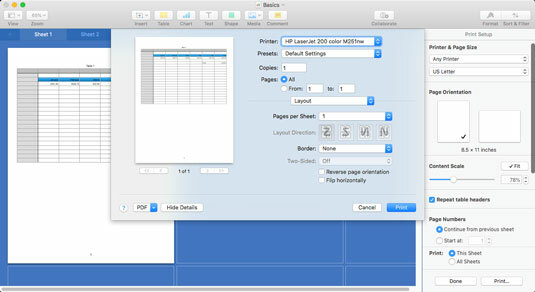 To print a range of selected pages, select the From radio button, and enter the starting and ending pages. 6. Click the Print button to send the document to your printer. Click the Share menu item to send a copy of your spreadsheet masterpiece to others. Click the Collaborate button on the toolbar to allow others to view or edit your spreadsheet from your iCloud Drive as a shared document. Ready to select the number of copies and the pages to print.